YES! A hoodie with a built-in neoprene pocket for beverages! This unique patented design from Huzu and J. America maintains the sleek look of a traditional hoodie, but packs more functionality than a Swiss Army knife. The insulated pocket has reinforced stitching that keeps your beverage sturdy whether you're playing corn hole or flipping burgers. Unlike traditional hoodies, the Huzu Velcro seal is great for storing cell phones, wallets, and other valuables that you need to keep secure and prevent from bouncing around or falling out. Also great for holding fly boxes for fishing, small backpacking and hunting equipment, diabetic meters and more. Stitched-in neoprene beverage holder inside front kangaroo pouch pocket. Holds a 12 oz bottle or can. Velcro seal above neoprene opening makes storing cell phones, wallets, and other valuables discrete and secure. Not good for coins or other loose money. Metal bottle/can opener in front pouch pocket is attached to a elastic cord via a split metal key ring. Roughly hangs 12" down from the top of pocket. Bottle opener is removable for washing and drying hoodie; cord's sewn in. Join the dark side of Christmas with this Darth Vader ugly Christmas sweater. 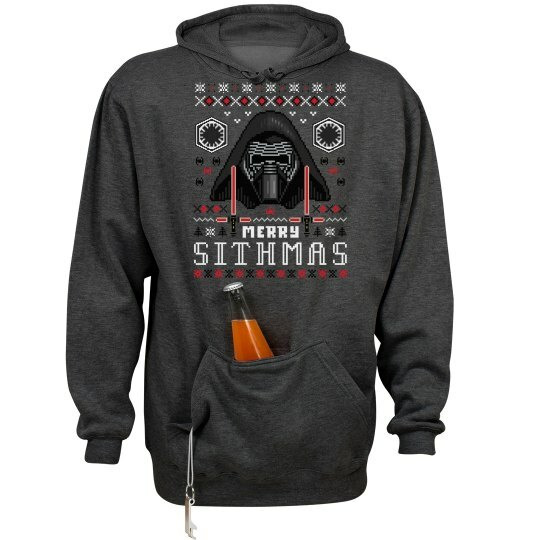 You'll be on Santa's naughty list once you join forces with the Sith on this Merry Sithmas hoodie.